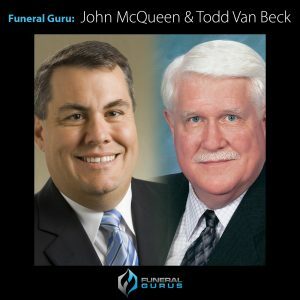 A Tag Team edition of Funeral Gurus with John McQueen of Anderson McQueen Funeral Homes in St. Petersburg, FL and Todd Van Beck of John A. Gupton College in Nashville, TN. John and Todd share their thoughts on the state of the Funeral Profession, challenges Funeral Homes may face for 2016 and share some strategies on how to make 2016 your best year yet. McQueen, Van Beck and together with Robin Heppell will be hosting a free webinar on Wednesday, December 16, 2105 titled: 3 Easy-To-Implement Strategies For Your Funeral Home To Supercharge Your 2016. To register, go to: /free-webinar and complete the registration form.